I usually drink in the wholesome surroundings of Beer Street though I occasionally wander into more dubious territory. The last time was when my siblings decided they were going to have a gin and tonic challenge. As a professionally trained taster (and amateur piss head) I thought I’d slum it in Gin Lane with them. 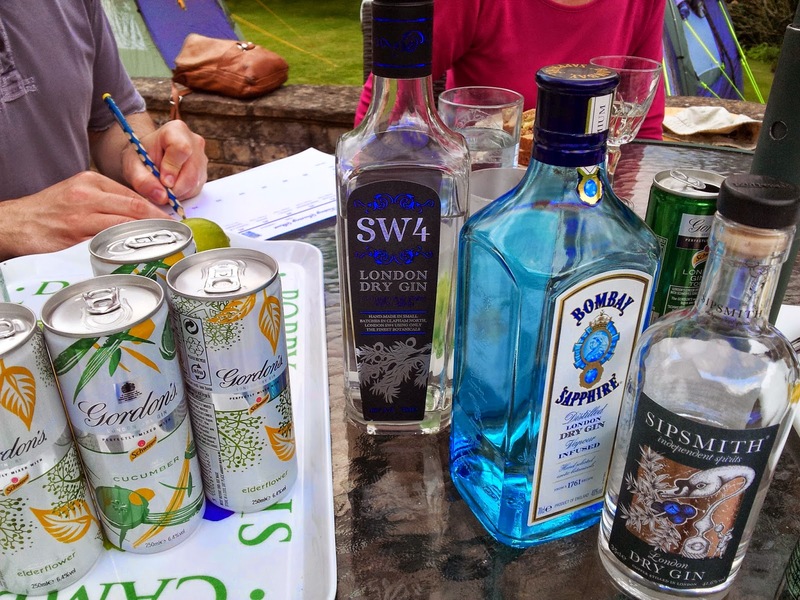 A selection of gins was assembled with bottles of Fever Tree tonic, as well as some cans of ready mixed gin and tonic. There was no definite consensus on the best, and the spicy nibbles we munched through weren’t ideal for serious tasting, but the ready mixed drinks generally fared worse than the do-it-yourself ones. I was back in the maltings recently to do a test on a barley sample. I needed to measure the Germinative Capacity, which is defined as the percentage of grains that would germinate under optimal conditions. Bascially you put 100 grains in a water to which a small amount of hydrogen peroxide has been added and see how many germinate. The hydrogen peroxide kills off any bugs on the surface of the grain, and keeps the water oxygenated, so there's plenty of oxygens available for the grain embryo. A straightforward test, but not one I was looking forward to doing as counting out 100 grains sounded tedious. That is until I saw the seed counter. Isn't it a thing of wonder? Sadly when it was time to count the germinated grains it was an altogether more manual affair but you can't win 'em all. "Lager-brewing arose in 15th century Bavaria and is nowadays the most popular technique for alcoholic beverage production in the world. The technique is characterized by low temperature fermentation using the domesticated yeast Saccharomyces pastorianus (synonym S. carlsbergensis). It has been clear that the lager yeast is a hybrid with one portion of its genome having originated from S. cerevisiae ale yeast . However, the source of the non-ale subgenome, which endows lager yeast with cold tolerance, had been a matter of debate . Recently, a Patagonian origin hypothesis of lager yeast has been proposed based on the discovery of a new cryotolerant Saccharomyces species from Patagonian native forests of Argentina . This yeast, named S. eubayanus, exhibited the closest known match (99.56%) to the non-ale portion of lager yeast and, thus, was believed to be its progenitor. However, we now show that this yeast species is likely native to the Tibetan Plateau. One of the Tibetan populations of the species exhibits closer affinity with lager yeast than the Patagonian population as inferred from population genetics and genome sequence analyses. We thus provide strong evidence for a Far East Asian origin hypothesis of lager yeast, which apparently corresponds better with geography and world trade history." I was admit when I first heard the Patagonia news I was more than a little dubious about it. It seemed so unlikely I found it hard to believe, but with strong evidence to back up the claim I had to accept it. Now that it seems that Tibet has an even stronger claim I don't feel quite as surprised. I guess I've only a limited capacity for astonishment. In fact if the next bit of news narrows the source down to a bottle of Tibetan beer a yeti gave to Lobsang Rampa I'll probably just nod along matter-of-factly. Dent Brewery in Cumbria has been forced to close due to rat infestation. It was on the second visit of health officals that they served a "Hygiene Emergency Prohibition Notice" and shut it. While it might not be possible to guarantee rodents will never get at your grain, they'd had three weeks from the first visit to get the problem sorted so they really should have. A bit of inconsistency from a microbrewery I can put up with, but there's no excuse for not having a pest control plan. I was recently in Italy to judge a beer competition, and though it was hard work I have to say it's not a bad way to earn a living. 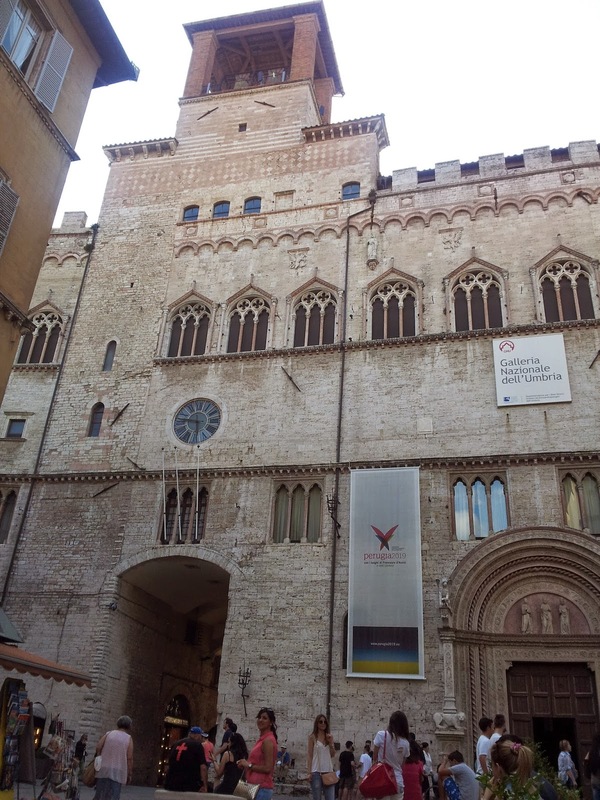 I was staying in Perugia, an amazing looking place with more history than you can shake a stick at. The beer scene is altogether more modern though, and from the many beers I tasted I'd say inspiration is drawn from around the world. A short walk from the city centre is a craft beer pub called Elfo. It's a great place with a good selection, and if a lot of the beers did tend towards grapefruit flavour that's not a bad thing. If such beers are now to be found everywhere then it's a step forward from when bland lagers were the only ubiquitous beers. 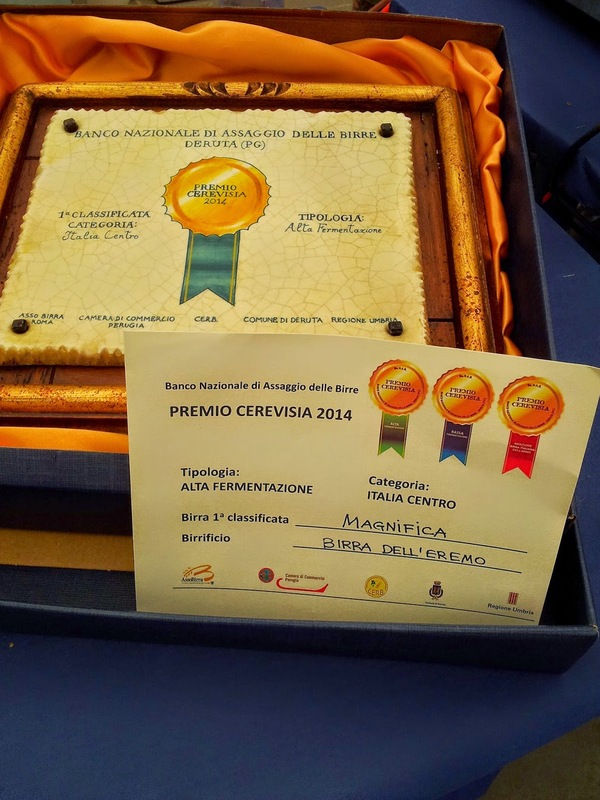 The competition was open to all breweries (there are over 700 now), and divided into three reigions of Italy, with top and bottom fermented categories. Ceramic plaques made in nearby Deruta were awarded to the winners. This one was won by Birra Dell'Eremo, based in nearby Assisi. Drink their beers if you get the chance! Interest in beer is definitely on the up in Italy, and when I popped in a supermarket there was a premium bottled beers section containing local and imported products. There was even a scotch ale from Tennents. It was nice to see a scotch ale made Scotland, rather than say, Belgium. Shame I've never seen it in Britain but interesting to see it in Italy. As I'm far too young to have seen that sort of thing I thought it was just another bit of history that had gone forever. I know some breweries still have wooden barrels but what with locator boards and fork lifts I doubted they were piled up in pyramids. I should have thought it through though. Breweries might not use wooden barrels much nowadays but distilleries certainly do. 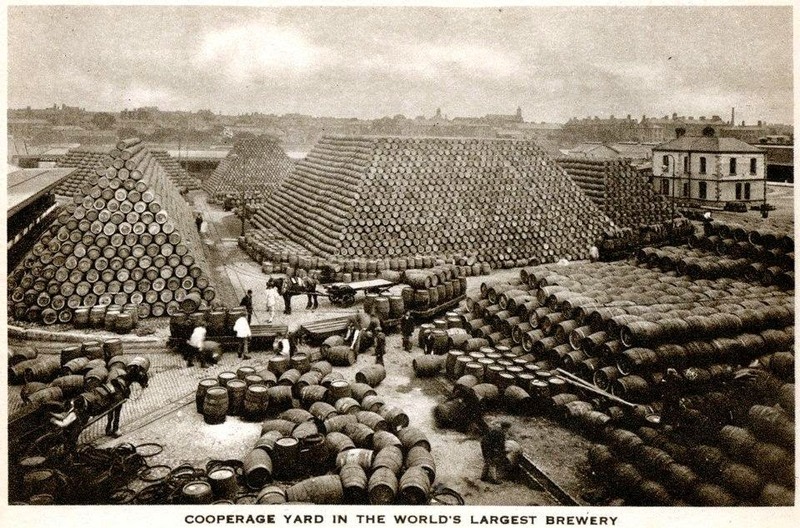 When looking up North British distillery I spied a picture of barrels piled up just like they were in 1911. The picture's from 2005 but there must be a good chance they're still stacking them like this. 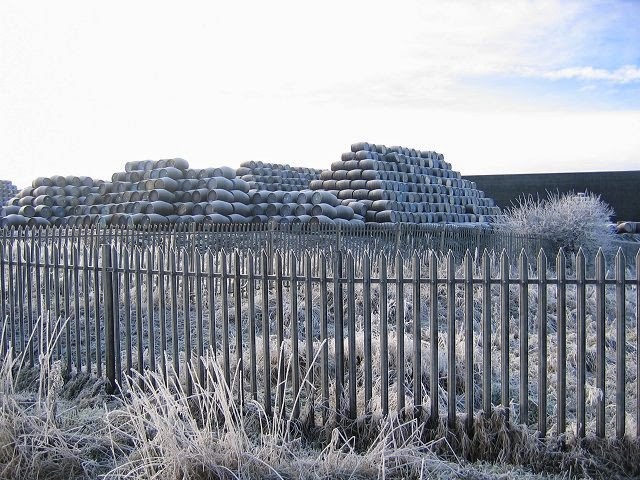 Is it wrong to want to go to Scotland just to look at a pile of barrels?